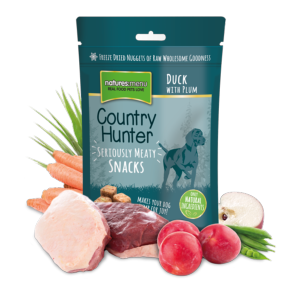 Nutritious Raw meat nuggets simply freeze dried to lock in nutrients and flavour. Packed ready for your dog to enjoy as a mouth watering snack or treat for training or when out walking. Duck is a nutritious meat particularly high in mineral content such as Selenium, Zinc, Copper and Iron, Calcium and Phosphorus. In its raw state it also includes omega fatty acids known for playing a role in heart, kidney and skin health. Plum is a traditional British fruit with nutritious Beta Carotene & Vitamins A, C and K.